We took a ride into DC for our first Nats game of the season yesterday. After a thoroughly enjoyable dinner at Gordon Biersch with friends—including a six-beer sampler for yours truly—we walked over to the park and were seated just prior to the first pitch. The temperature began at a warmish 54 when the sun was up, but clouds and nightfall brought it into the lower forties where it remained the rest of the night. It wasn’t too chilly until around the sixth inning. The game ran to twelve innings. Our car’s heater never felt so good. The Nats are off to a slow start this year. Last night made five straight losses. Particularly galling were the number of Mets fans in attendance. “Let’s go Mets” was routinely drowned out by boos. It was a friendly rivalry in the stands. We’re looking forward to more games—and warmer weather—this season. 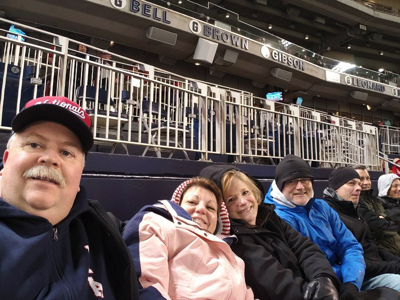 Nats Park is a great place to watch a game and last evening’s seats were terrific, positioned in the arc behind home plate and just above field level. There’s really not a bad seat in the house, but these were the lowest-level seats we’ve sat in since the stadium was built. Bonus: it was pups in the park night, so we say plenty of four-legged friends including a beautiful two-year old Lab.